The dial of the first ochs und junior was made from white 18K gold. Its surface wasn’t white though, it was dark, smokey gray! 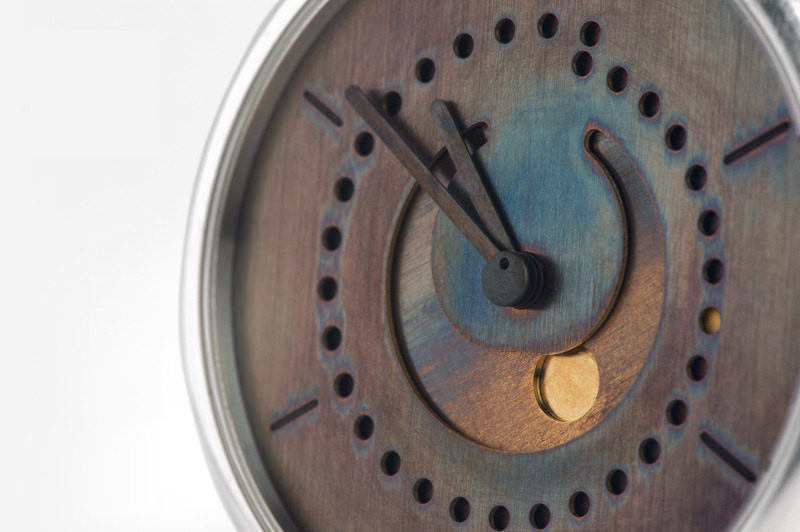 The original anno cinquanta dials were heat-patinated in an enameling oven at 950 degrees Celsius by Ludwig Oechslin in his La Chaux-de-Fonds workshop. 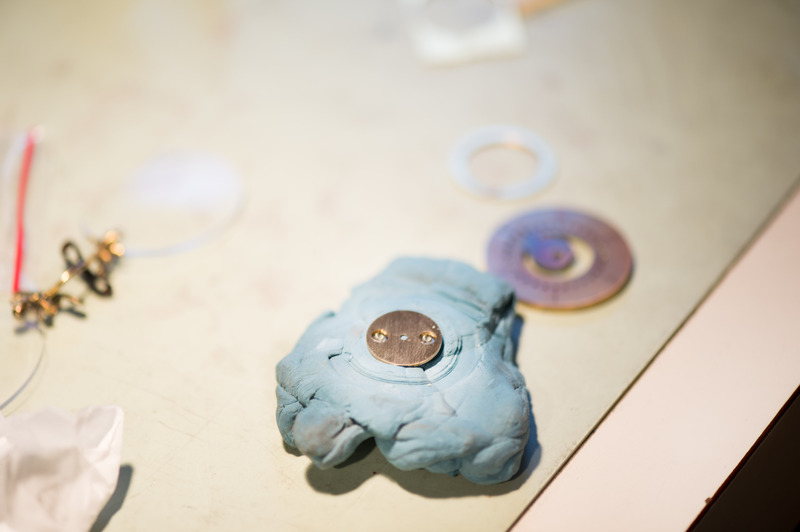 The high-contrast indices were the result of milling out the patinated metal to reveal the untouched metal beneath. 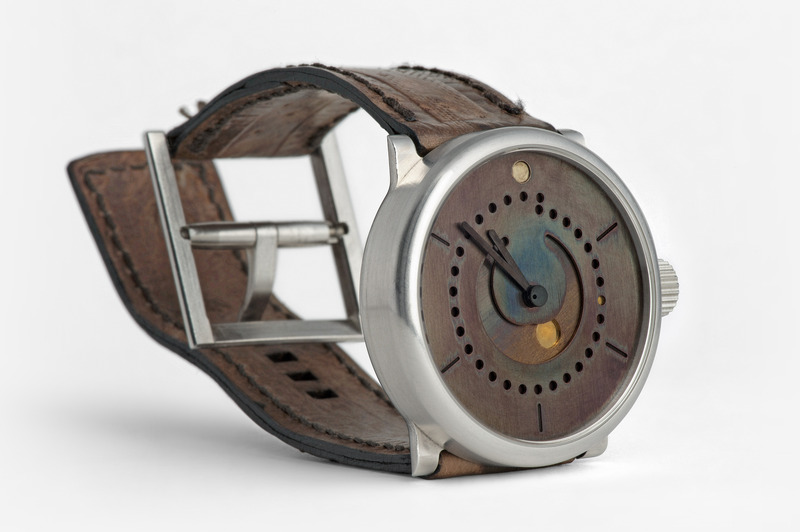 So ochs und junior’s use of patination to create dial contrast reaches back to the very earliest 2008 production watches. However, the idea actually stretches back even deeper, into the personal workshop of Ludwig Oechslin, and to his very first ochs und junior prototypes made from a much humbler material, brass. The source of the idea was Oechslin’s notion of practicality. 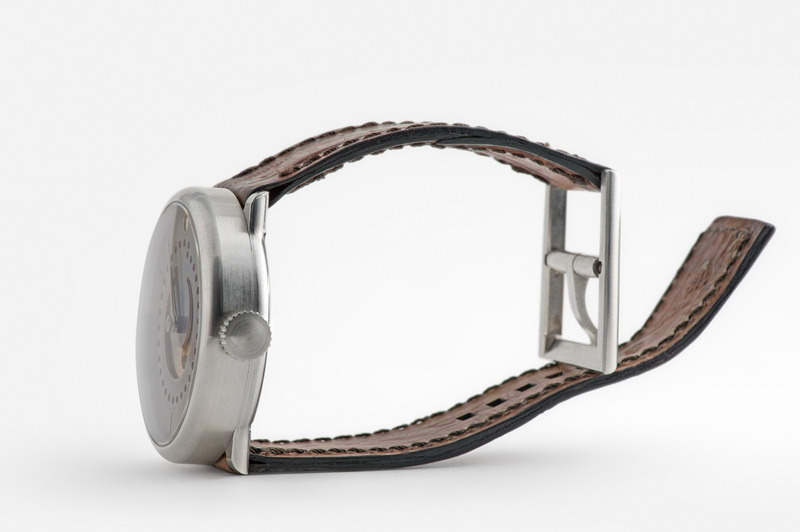 Oechslin’s goal for an ochs und junior watch is always that it be useful to him and that it bring pleasure in use. Essential to a useful watch is contrast between dial components. Waiting for a partner to color parts would slow down prototype development and inhibit the iterative process that leads to his final design. A friend of Oechslin, the watchmaker Beat Haldimann, once gave him a bit of patination “poison” (pictured in the green bottle in the photo above). Oechslin first used this on the brass parts he machines in his workshop. Even though the idea was born from practical necessity, there was a raw, imperfect, and original beauty to the result. 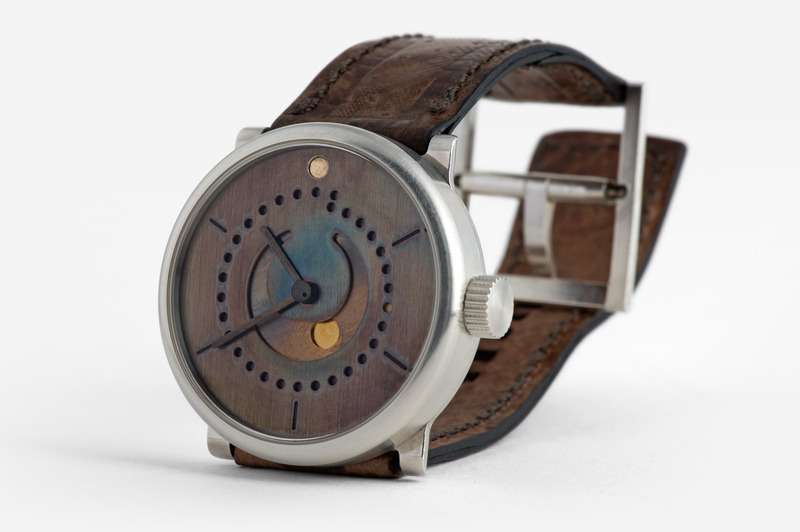 In 2012, we first launched a brass watch with a patinated dial – moon phase (or selene) patina. By then, Oechslin had passed on his patination technique onto Peter Cantieni, who mills and machines all of ochs und junior’s parts. Cantieni executes all of our gray patinations. You can see excellent examples of his work in this recent post (Photography). 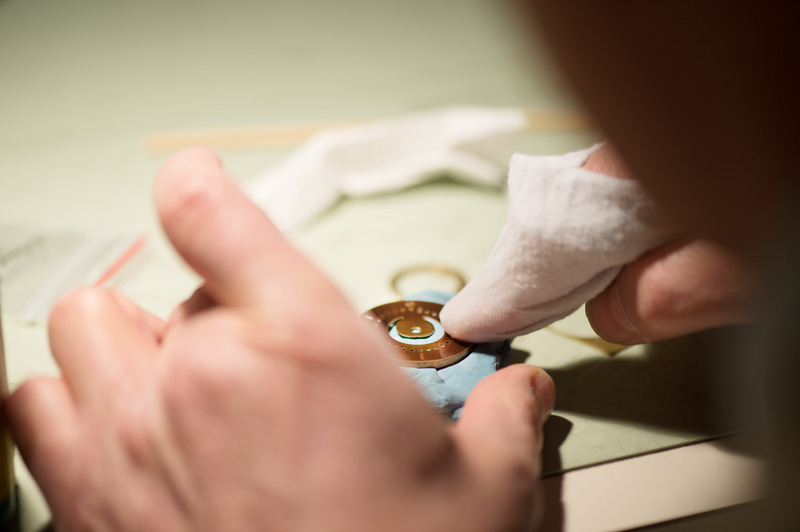 When I first joined ochs und junior in 2013, I wanted to better understand how our watches were manufactured. To see the whole process I knew I would need to be in Peter’s workshop for several days, but Peter Cantieni strongly prefers to work alone (he has never taken on an apprentice). So, I decided my strategy would have to be to make myself useful. I asked Peter if he could please show me how he patinates, so I could help. He was quite surprised that anyone would actually request to work with “the poison”, as he called it, and laughed his slow, catchy chuckle with a broad smile. The goal of patination can be different than to create dial contrast though. 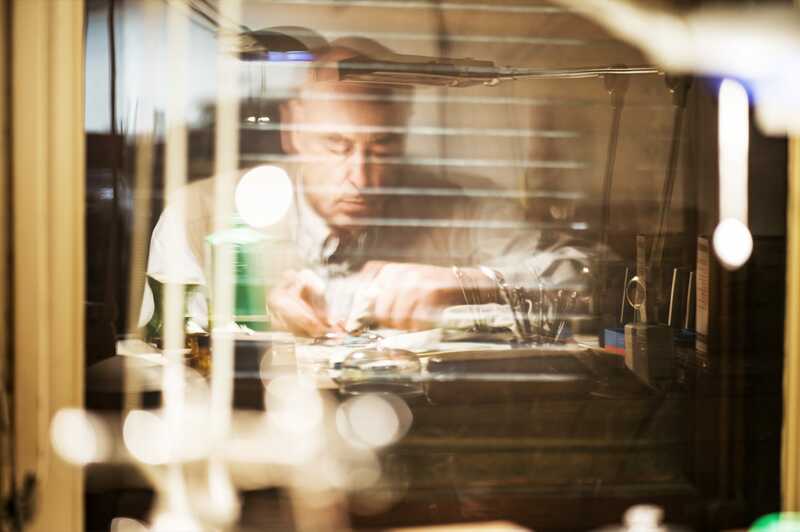 Oechslin has always wanted his watches to bring pleasure to their wearer – and this can also come from a watch capturing a personal idea or inspiration, which is the story of the moon phase watch being made in in these pictures. I’m glancing over Ludwig Oechslin’s shoulder, curious, while he applies the patination liquid to my brass dial with a piece of old fabric. Neither he nor I know how it will turn out. His hands obstruct the view, as I attempt to photographically document the whole process. “Wow,” I answer, “that has turned out even more beautiful than I imagined.” Brown, earthy, a little wild with that blue spot. It’s not an even color and therefore, perfect for me! 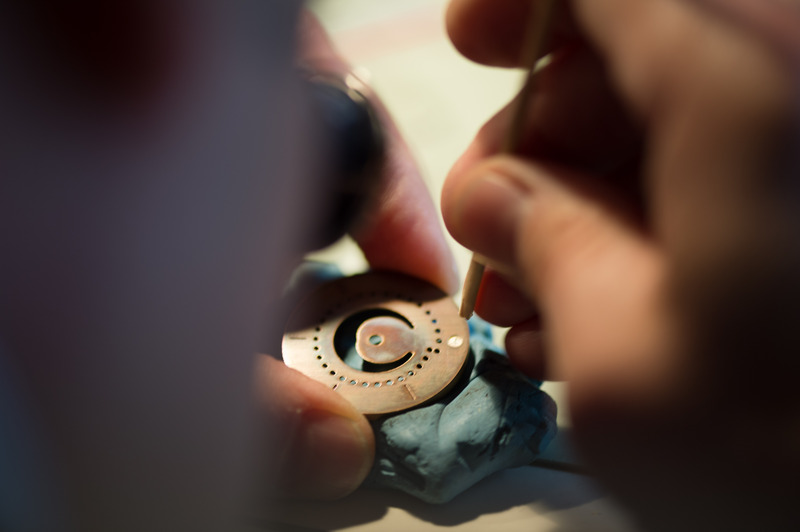 All of the pictures above show Ludwig working on Bea’s personal 39mm ochs und junior moon phase. The final watch is in the pictures you see below! 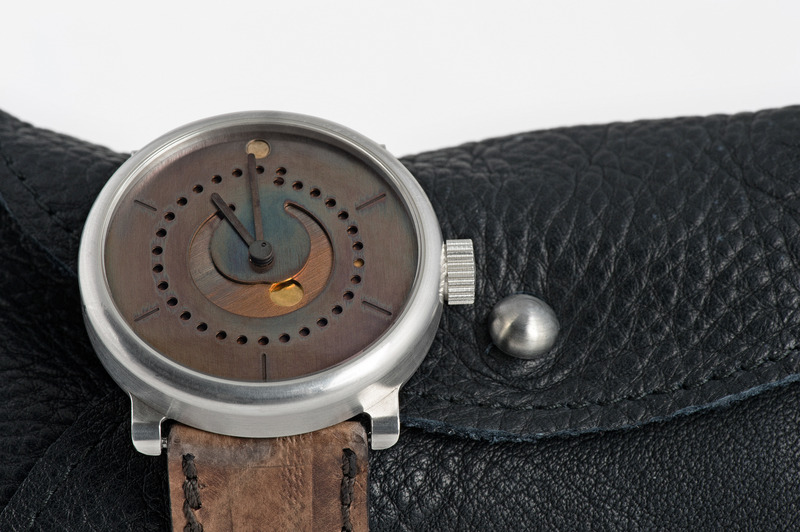 The dial is several colors at once. Blue, brown, gold, black, gray, orange and more. The center of the dial around the earth is blue, and a clear trail of blue highlights and traces the holes of the date spiral. The sun and moon have been cleaned out with a pegwood tool, so that they stand forwards as the focus, along with the date dot. But not too perfectly. And blue also emphasizes each of the markers. You will notice a number of light scratches on the silver case. Bea is a photographer and her watch is on her wrist through photoshootings and all the daily activities of her busy life. The watch is set on a custom-made waterproof sturgeon band, manufactured especially for her wrist size of 15cm. 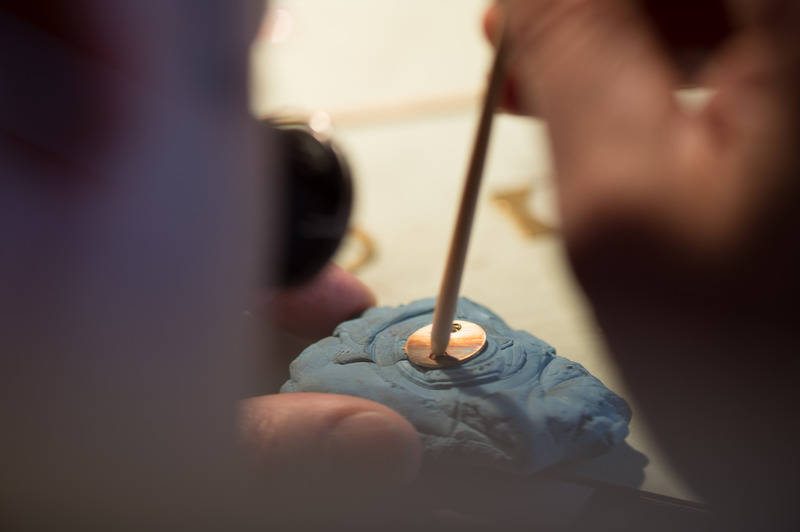 Ludwig has passed the knowledge of how to do this type of patination on to ochs und junior watchmaker Sandra Flück. In her careful hands, we look forward to further expressions of this ochs und junior tradition.